TV invaded 421 Oak Street on March 25, 1952. Dad had written to the Lafayette TV Company on the East coast and ordered the floor model. He explained to them that he had an interest in becoming a Midwest dealer, in hopes of obtaining a price reduction. The closest station was in Kansas City, so a good antenna was vital. 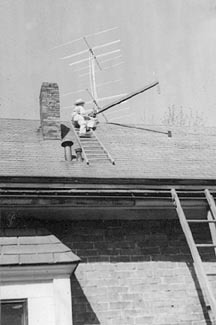 I helped erect a yagi on the roof, whose mast extended through the roof, attic, and down to the first floor by the bathroom. A handle and compass card were attached to permit alignment and rotation of the antenna toward the station. Wind was a problem and a locking device was added to prevent unwanted turning. Quite a vibration was set up at times in the wind and the mast "sang". Early viewing was limited to pre approved programing that was set down in a daily log and approved by Mom or Dad. Early experiences with ducting or skipping signals due to weather conditions in upper atmosphere brought in test patterns from as far away as Arizona, which were photographed by Mom. Later experiments with antennas included rhombus types. One was formed with wooden cross members on the roof mast, but proved to be too much wind load and had to be taken down. 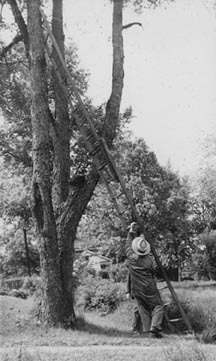 The other rhombus (diamond shape) was spread between a tree on the playground to three trees in Roy Vestal's vacant lot. This was unique in that Dad arranged pulleys to raise and lower the points to, in effect, point the antenna in various directions. An elaborate matching device brought the impedance to the proper 300 ohms for the TV to use. This experiment also passed. The early programs included, Dave Garraway, Jack Paar, Hallmark Hall of Fame, Sid Caesar, etc.